21.5" x 14.5" x 16.75"
This charming bistro is owned and operated by a local family of cochons (pigs), now in its 3rd generation of operation. Le papa is the head chef, his sons are the waiters and maitre'd. 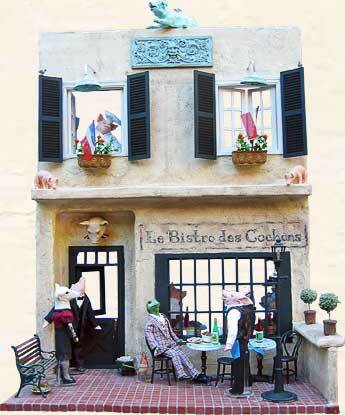 A quaint bistro where the "locals" come to dine. The bistro is best known for its patés, soufflés, and vast cheese selection from around Europe. Note the locals: Monsieur Grenouille (frog), Madame Mouton (sheep) and the local farmer Monsieur Vache. This 2 story building has a paper clay exterior, and a terra cotta terrace. The interior has white painted bricks and a tiled floor.